Situated near the North Shore of Long Island, Radisson Hotel Hauppauge-Long Island offers guests easy access to the Long Island Expressway (I-495) and a free shuttle to Long Island MacArthur Airport (ISP), Brentwood Train Station (LIRR) and other destinations within 10 miles of the hotel. As an added bonus, LaGuardia Airport is just a 36-mile commute, and John F. Kennedy International Airport (JFK) is only 38 miles away. After a busy day at the office or on the town in New York, return to the hotel for a relaxing soak in the indoor pool or for a drink at the on-site Spiritz Lounge. You can order room service for a quiet night in or try a variety of on-site dining options during your stay in Hauppauge. Enjoy a casual breakfast, lunch or dinner next to the atrium’s waterfall when you visit Fountain Grille. For those wanting a quick breakfast or lunch, Café Pronto serves Starbucks coffee, freshly baked pastries, sandwiches and other snacks. Wrap up the end of your week with an after-dinner cocktail at Spiritz Lounge, or choose from excellent restaurants close to the hotel, such as Mario's Italian Restaurant and La Scala Ristorante & Pizzeria. Sunken Meadow State Park – Just nine miles north of the hotel, this park offers sandy shores and a boardwalk for leisurely seaside strolls. You can also let a horse do the walking when you saddle up and hit the trails. Long Island Aquarium – Located about 35 miles from the hotel, this aquarium offers unforgettable adventures, from mermaid meetings to shark dives. Find yourself face to face with exotic fish when you go snorkeling in the lagoon or observe the indoor coral reef exhibit through the glass. Wineries and breweries – Long Island is full of wine vineyards and brew houses that each bring their own unique tricks to the trade. The nearest brewery, Great South Bay Brewery, is only about three and a half miles from the hotel, and Baiting Hollow Farm Vineyard, located about 34 miles away, features lush vineyards as well as a horse sanctuary. 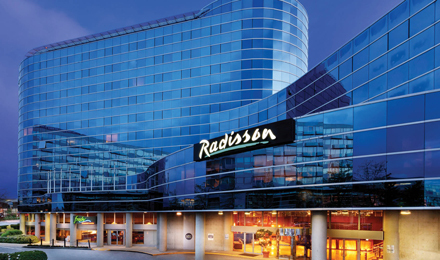 Located in the country's second-largest industrial park and about 10 miles from Long Island MacArthur Airport (ISP), the Radisson is an obvious location for business meetings and other corporate functions. Our 18,500-square-foot venue is also a perfect place for special occasions like weddings, anniversaries and holiday celebrations. An on-site florist shop can provide beautiful arrangements for your gathering. Surf the Web with free Wi-FiSurrounded by both tourist attractions and corporate offices, the 209 rooms and suites at the Radisson offer an ideal haven in Long Island for business and leisure travelers. Relax in the comfort of your hotel room after a busy day, and enjoy room service while you watch your favorite show on the flat-screen TV. Free high-speed, wireless Internet keeps you connected during your stay, and coffee facilities provide an energizing start to your morning. Stay on site and enjoy delicious casual dining in HauppaugeIf you’re looking for a convenient and tasty place to grab a bite to eat, the Radisson offers two on-site restaurants and a lounge that are great options. Meet colleagues for breakfast or share dinner with the family at Fountain Grille, which is next to the atrium waterfall and offers continental cuisine throughout the day. Café Pronto lets you start your day with a cup of Starbucks coffee, a freshly baked pastry and other snacks before you head to your business meeting or out for a day of touring the city. Spiritz Lounge features creative cocktails and a light fare menu, and room service is available for those who prefer a quiet meal to themselves.